I have the opportunity to upgrade from a C&P Pilot to an A. Olmesdahl New Champion 8x12 press. I’ve only seen a couple on BriarBress in the past. 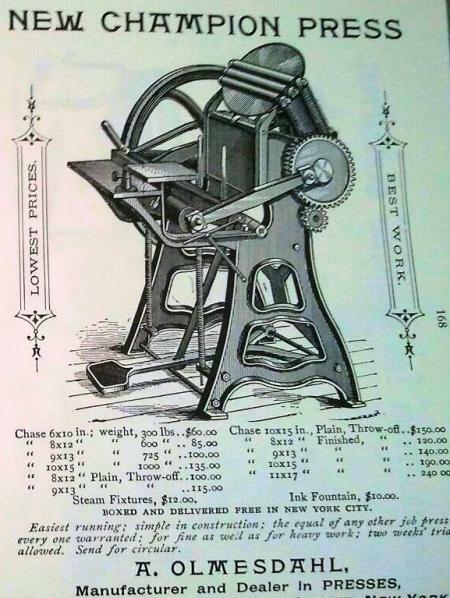 Curious if any of you have printed with this press and what your thoughts are? I mostly print smaller stationery sets but looking to get into printing larger A2 greeting cards and A7 Invitations and think the larger press would be great for this. I also like that it doesn’t have the larger footprint as other floor model presses as my space it limited. Just thought I would post and see if anyone has seen one in the wild. Thanks in advance. I like my New Champions. They’re light running, meaning easy to treadle, however they are light weight presses. They can’t handle big forms nor heavy impression. One of mine was broken due to too much impression. They’re easy to transport due to their light weight. I’ve taken them to shows. I’ll back up just what John said, they are a nice press to treadle. 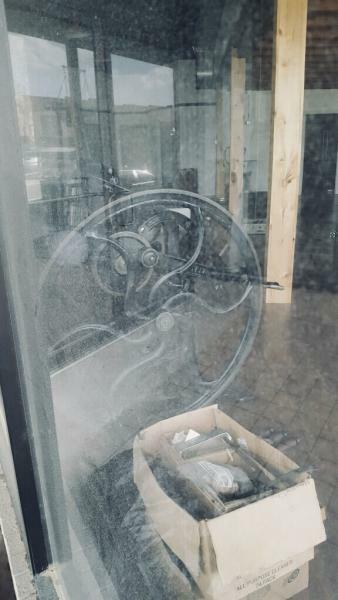 The one I have is “geared down”…..meaning you pump one more time compared to other presses, which on a larger press makes it easy to treadle. This style press has a unique design too with the two large springs which help offset the weight of the platen as it closes…again making for a smoother running press. I also see a throw off - another nice option. Not all of them have throw offs, mine does not!!!! This is for sure a step up from a Pilot, NOT that Pilots are good presses!!!! And again agree with John - careful printing a full chase of type. This is a lighter press and doesn’t have a back bone like a C&P. Thank you both! I figured it wasn’t as “strong” as the 8x12 of 10x15 C&P presses. I’m more of a hobbyist printer and don’t have the space for those, but could fit this in our home office a lot easier. I would never try and print the full chase size. Largest Image area I see my self printing is about 4.5”x 6.5”. And I normally don’t go for deep impression. Just enough to know it was letterpress printed. Where do you see a throwoff? I didn’t see one at first but I think this is it in the side view. Is this the throw off? Similar in style to an older Gordon platen or maybe Golding Jobber? Steve, $85 in 1889 converts to about $2200.00 in today’s dollars. There are too many other options for what I could do with $2200! I didn’t pay that price tag, but picking her up tomorrow! Thanks again for the comments.